The Sino-Asian Institute of America also makes annual pilgrimages to Kyoto, to temples, museums, and shrines, when cherry blossoms (spring), and red maple leaves (autumn) highlight Japan’s Buddhist and Shinto inspired family culture. The Sino-Asian Institute of America has, since 1999, encouraged special pilgrimage opportunities to the sacred places of Tibet, from May through September. Five pilgrimage options are available, through SAIA’s contacts in Asia. Currently no pilgrimages are scheduled, but we hope to resume in 2009. As a result of these trips, and the generosity of those who came on pilgrimage, the Sino-Asian Institute of America has built 5 schools in Tibet, and helped build one school for girls in Afganistan. 8 plus 143 pages. A translation of learned articles by four of the China’s best scholars; Written after Tiananmen, 1990-91. Ren Jiyu shows that there are really no differences in Shen Xiu’s northern Zen, and Hui Yuan’s southern Zen. Du Jiwen finds best Buddhist scholars were minorities, not Han Chinese. Cai Dahua shows the influence of Zhuangzi in major Chinese Buddhist schools; Jiang Shuzuo traces early Buddhism in art motifs. 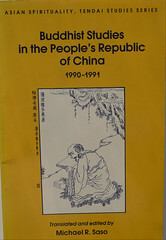 Recommended for university and graduate seminars, understanding Buddhism in China.